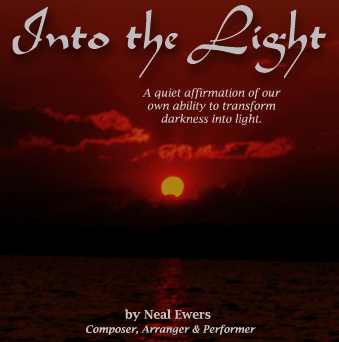 Neal Ewers, the composer and arranger, has once again woven together a beautiful tapestry of warm, quiet sound designed to help all of us find that quiet place within ourselves we often need to reach. Some songs combine numerous instruments as they unfold their quiet sound, while others sing their simple melody and harmony with the sound of delicate bells. The Kurzweil K2500XS keyboard on which these songs were produced allows Neal to record live sounds such as trumpets, bells, harps, cellos, English horns, and choral ensembles. Thus, the listener actually hears the sounds of the real instruments as they work in harmony with each other to create music designed to help us find our way to the light. We invite you to sample some of the selections from this warm and peaceful collection. You'll need the free RealPlayer to play these Real Audio clips. Select the RealPlayer icon or visit the Real Networks Web site for further information. If you you have a fast connection and prefer to hear higher-quality MP3 format files, visit our MP3 Clips page. My hope is that this CD will allow us all to slow down the hectic pace of our lives long enough to find our way to the light of peace that resides within each of us. Perhaps it's simply a quiet, reflective time with friends which brings us into the light and helps us find peace. Maybe it's just our awareness of the emotional essence of the music on the CD as it weaves itself in and out of minor and major keys to ultimately break through into the light and end up on a major, positive note. Perhaps it is light which comes forth slowly after a time of sorrow or unhappiness we may be experiencing. Or, it may simply be the winding down of our lives at night as we are preparing to go to sleep. And that's how this CD began. I bought a CD player for my wife, Ginevra, who put it by her bed so she could listen to quiet music as she drifted off to sleep. I began writing quiet, peaceful songs which I thought might help her have a peaceful night. I continued to add to the collection, and every month or so, she would find a new CD in her player. Sometimes we play them when she is awake. Rather than putting her to sleep, they simply allow her to relax and reflect on her feelings of calm which she says the music helps her find. She breathes more deeply, sighs a lot, often stops what she is doing to better hear the music, and says that as she listens, she feels lighter and more at peace. Whatever your need, whatever positive ray of light you need to find, I hope that these simple, quiet songs will help you reach some place within yourself where it dwells.